Paris is one of those classic travel destinations that you always hear so much about. It seems that someone is always going to Paris, and maybe it’s because they are. In 2017, there were about 40 million (!) visitors to this city. And fun fact – France is the #1 most visited country in the WORLD! Paris is an amazingly charming city with a little bit of something for everyone. 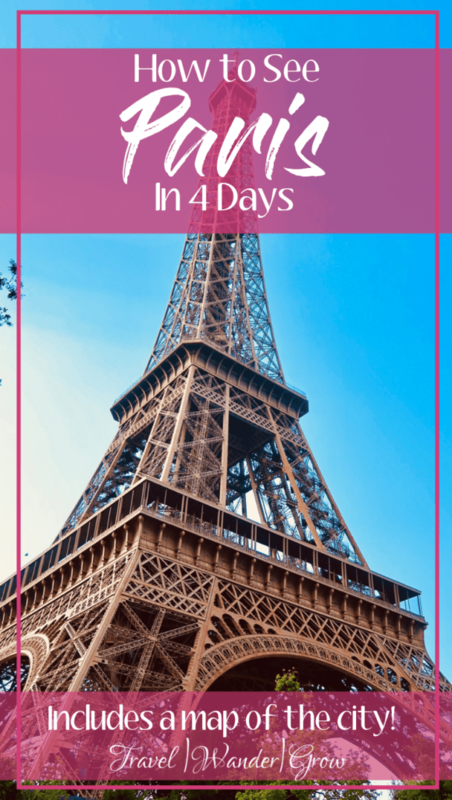 In this post I’ll give you a 4-day Paris itinerary for that perfect long weekend trip. I’ll also provide a short travel guide to give you the info you need to know before your visit. Paris was first inhabited by the Celtic Parisii tribe, through the 3rd century B.C. Like many well-known European cities today, Paris was conquered by the Romans, becoming part of their empire in 52 BC. The city was known as Lutetia (Parisiorum) then Parisius, before being known by the name we call it today. In the middle ages, the city was ruled by several dynastic kings, who led the city through periods of ups and downs over the years. Paris became of the centers of the Age of Enlightenment in the 18th century AD. Surprisingly enough, the cafés that began to pop up in the city aided this time of great thought. They became places where intellectuals gathered to exchange new ideas and news. The French Revolution began not long after the start of this new Age, making France one of the first countries not ruled by a monarchy. Following a period of chaos, Napoleon I began rule of the country and actually brought back some normalcy to everyday life there. Following his demise, Paris went through a period of reconstruction. It was during this time that Paris got that classic look that is so well known (cream colored stone, dark blue roofs) by order of Napolean III. Since that time, Paris has become known as an influential global city. Particularly in the areas of finance and fashion. Today, it is the third most economically powerful city in the world, only behind London and New York. Getting There: There are two international airports that service Paris: Charles de Gaulle and Orly. There are a few other airports that serve the city, but it is most likely that you will fly out of two mentioned here. If you are visiting from neighboring European city or from another city in France, you may arrive by train. There are 7 major train stations that take you to different cities/ countries and you can find them all listed here. I recommend comparing costs / travel time when considering how you’ll plan to arrive in the city before purchasing your ticket. Getting Around: The metro system and bus routes in Paris are very efficient and cost-effective. I highly recommend that you use them as your primary method of transportation while you are in Paris. When traveling to the suburbs of Paris, you can take one of the RER trains. These trains will take you to/from the airports and out to major destinations like Versailles. You can use the same tickets for the metro/bus, and once you arrive in the city you should buy a carnet (10-pack) of tickets at a time to save you money as you travel around the city. Click here to download a metro map! One additional thing to note – Uber is available in Paris as well. When to Go: I’ve been to Paris twice, once in December and one in July. Personally, I preferred visiting during the winter over the summer due to smaller crowds. The weather wasn’t too cold the winter we visited, but know that this may not always be the case. I recommend traveling late Spring or early Fall to avoid the crowds but still have the most pleasant weather. Currency Situation: France uses the Euro, like many European countries. At the time this post was written, the exchange rate was €1 = $1.17. Although credit cards are widely accepted, I recommend taking out some euro to pay for miscellaneous expenses. Language Considerations: The language of Paris is, of course, French. It is helpful to know some basic phrases before your visit so that you can greet other appropriately. Check out this page for basic French for tourists. As mentioned in previous posts, like my 4-Day Iceland Itinerary, my experience is that the best way to get to know any city is by a walking tour. 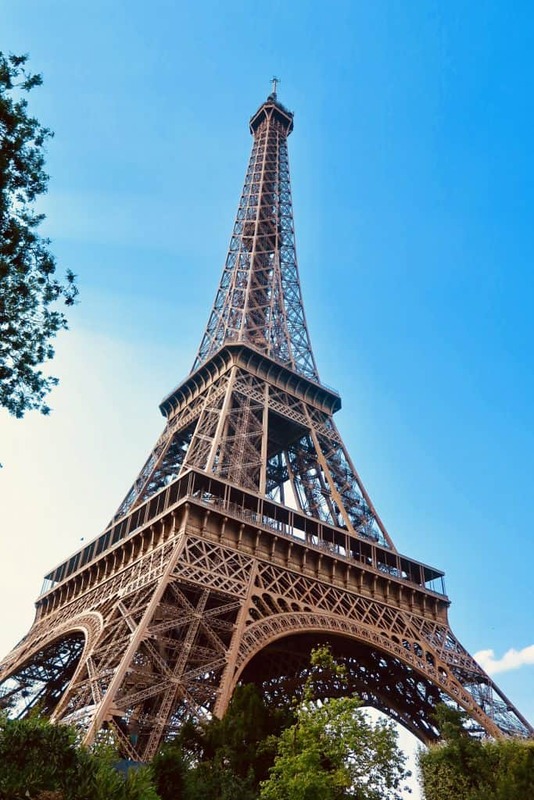 I recommend checking out the Paris Landmarks Tour by Discover Walks. It will take you to many of the well-known city landmarks, such as Montmartre (neighborhood with sweeping city views), the Lourve, and the Eiffel Tower. 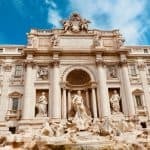 This tour will help you get oriented to city, but note that you won’t visit the inside of any landmark during this tour. You will have time to stop for photo ops though :). I admit that we did our tours with a personal family friend who is native Parisienne, but this tour comes highly recommend on TripAdvisor. You can take the tour at either 10AM or 2:30PM, and it lasts for 90 minutes. In the evening, take a Dinner Cruise on the River Seine. You can enjoy a wonderful meal with a tour like this one, and see the sights from different perspective at night. 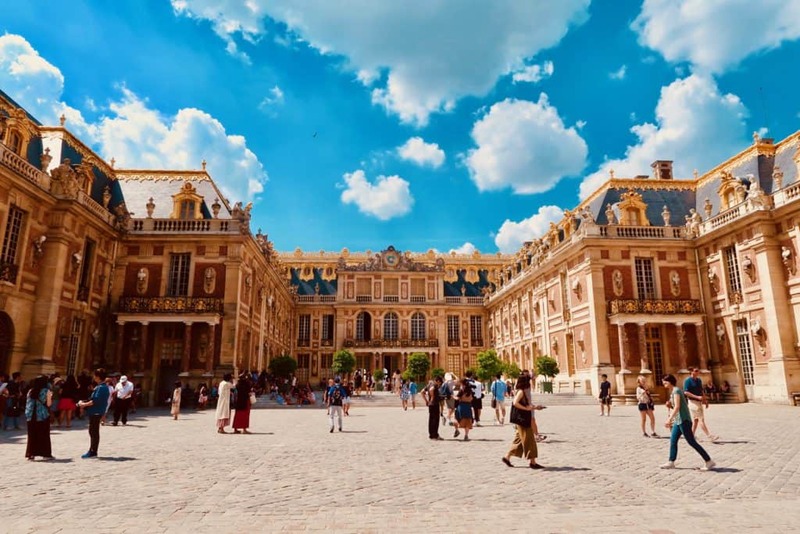 On your second day in Paris, head down to Palace at Versailles. Versailles was the last home of the French royalty, most famously Louis XIV and Marie Antoinette. The scale of the palace is just ridiculous, I can’t even imagine living in a place of that size! While most of the original furniture is gone, you can still catch many original royal portraits. And they are really something! To get there you can transfer from the metro and take the RER C to the end of the line (Versaille – Rive Gauche stop). I highly, highly recommend that you book a skip-the-line tour for Versailles, especially in the summer as the lines can be very long. We booked the tour linked above and could not have been more happy. After spending your morning in Versailles, travel to the Eiffel Tower. You can take RER C to the Champ de Mars stop to arrive a short walk away from the tower. For some, just visiting the grounds of the tower is enough. You can get cool shots of the tower itself and take advantage of the many opportunities to grab a bite to eat/drink. If you would like to travel up the tower, you should book a skip-the-line tour to visit here as well. Especially if visiting in the summer. The Eiffel Tower: Second Floor Priority Access tour is a great option for this, if you’re interested. For your third day in Paris, kick the morning off with a visit to the Lourve. The Lourve was a former royal residence that has since been converted into a wonderfully extensive museum. It houses THE Mona Lisa painting, as well as other works of art and historical artifacts. It was also recently featured in a certain music video by The Carters :). What you can’t see in this picture is the many people standing around the glass that encloses the painting with the cameras / phones up lol. Try to get here early, before the crowds arrive. That will help you get into the museum quickly without a special pass and view the sights without having to essentially stand on top of people. Note, if traveling by metro, you can access the Lourve by either the Lourve Rivoli or Palais Royal Musée du Lourve stops on Line 1. In the afternoon, head over to Notre Dame. This cathedral, constructed between 1163 and 1345 is a prime example of French Gothic architecture. Also, in case you haven’t heard, there is a very famous book and maybe even more famous Disney movie centered around this cathedral. Entrance into the cathedral is free, and the interior is just as intricately designed as the exterior. There is also an option to travel to the top of the building by buying a ticket (€8.50) at the kiosk on the left side of the building. You can access Notre Dame via the Cité (Line 4) metro stop. After visiting Notre Dame, stroll through the Latin Quarter. This neighborhood is just a few minutes walk from Notre Dame and is known for being home to many students. It’s actually called the Latin Quarter because Latin was the language of the educated for many centuries and was commonly spoken there. 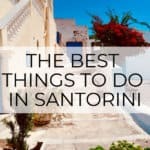 It’s a great place to buy a unique souvenir as there are many shops lining the streets and a perfect place to grab a bite to eat for dinner. Now, we all know that Paris is the fashion capital of the world, so a trip to this city would not be complete without at least a little bit of shopping. 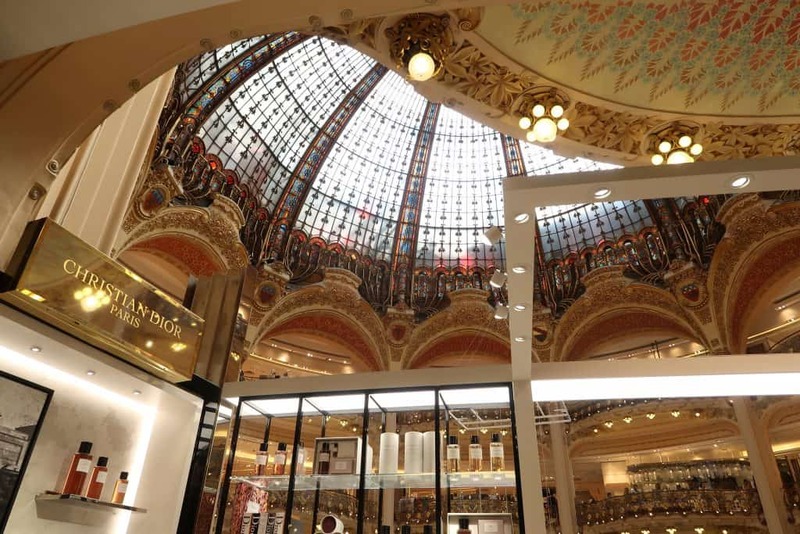 To start your day, head over to Boulevard Haussman for shopping in Paris’ most prestigious department stores – Galeries Lafayette and Printemps. The Belle-Epoque style of these buildings will make you feel almost as though you are visiting another palace. I promise you, these are nothing like any department stores you’ve experienced before! Despite the grandeur, it is possible to find regularly priced items. There is a wide variety of boutiques available within each department store. On this same street you’ll find outdoor shopping and eating places as well. You can use the Opera station (Line 3) to access this area of the city. The most famous shopping area of the city is probably the Champs-Élysées. This street and the interecting Avenue Montaigne offer upscale boutique shopping (e.g., Chanel) as well as global retailers (e.g., Zara). If you do happen to be shopped-out by the time you make it here, you can instead just soak in some beautiful views of the Promenade. 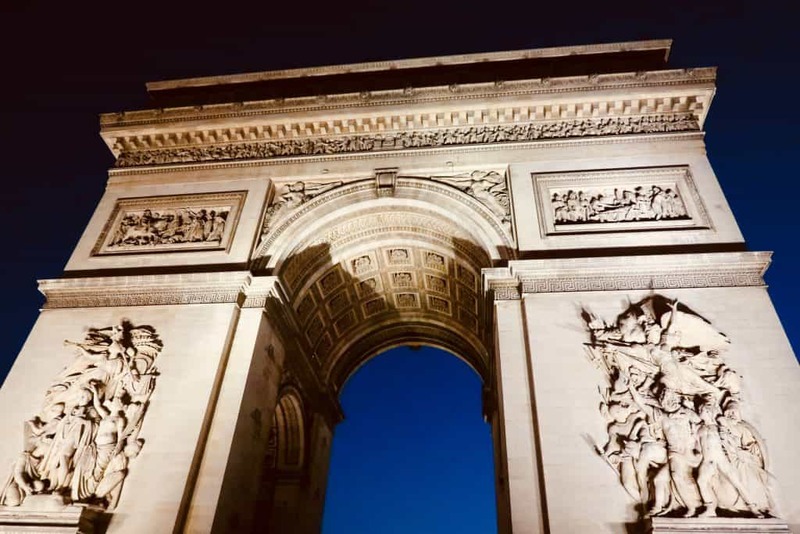 While you are in this area of the city, you can get up close to the Arc de Triomphe. Napoleon constructed this arch in the style of the triumphal arches built by ancient Roman emperors. In yet another opportunity for city views, you can climb to the top of the arch for a cool photo opp. A perfect way to close out your trip to Paris. Another location in the city where you can find landscape views of the city is in the Montmarte area. 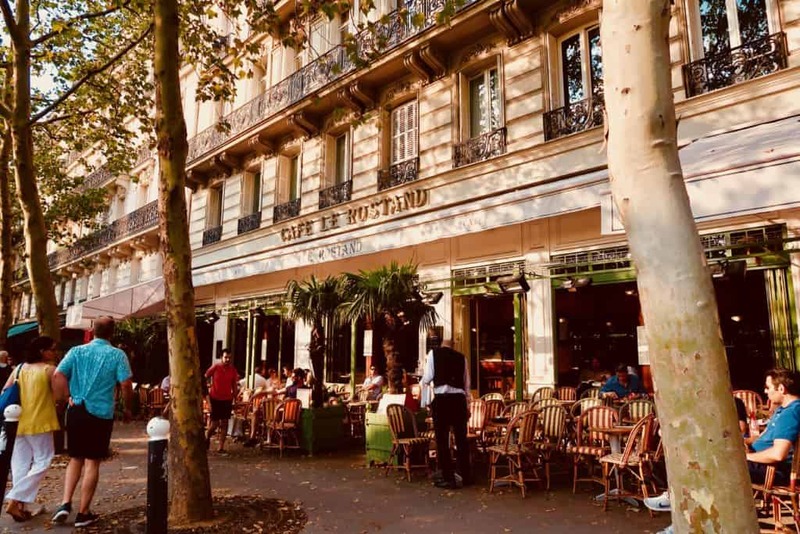 For information on this part of the city and where to find some of the best photo ops in Paris, check out this post on 15 Instagram Spots in Montmarte, Paris. 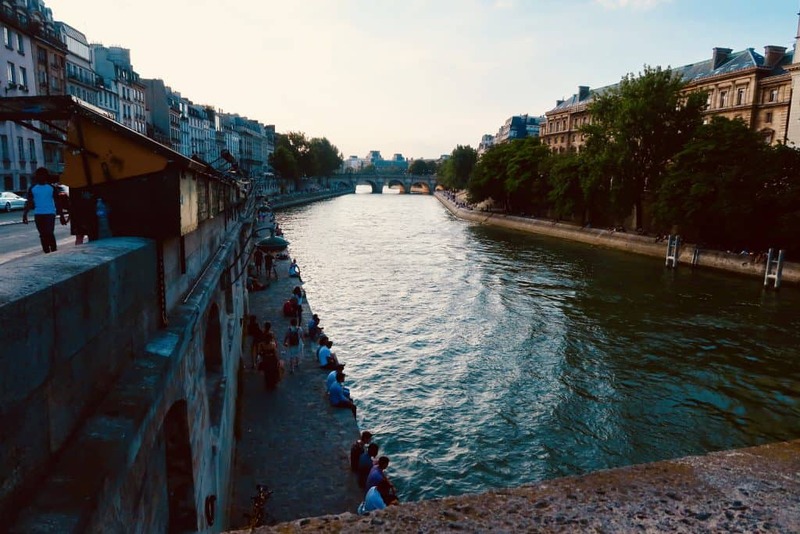 If I didn’t say it earlier, I’ll say it here – I LOVE Paris! I just returned from a visit to this city for the first time in 10 years and had a wonderful time. It was honestly even better than I remembered, or maybe I just appreciate it more in my older age :). 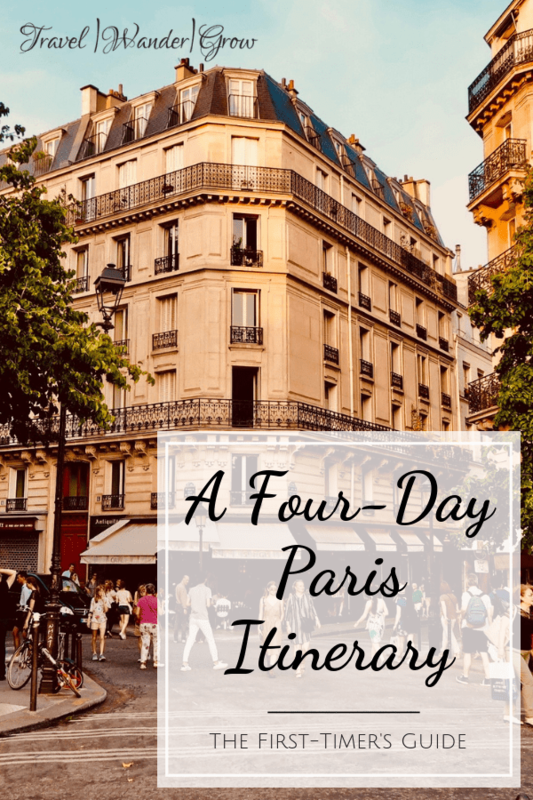 While you certainly can’t cover everything in a few days, this 4-day Paris Itinerary will help you to cover a lot of ground. 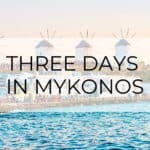 I hope that you have found this itinerary helpful in planning your next trip to this enchanting city! 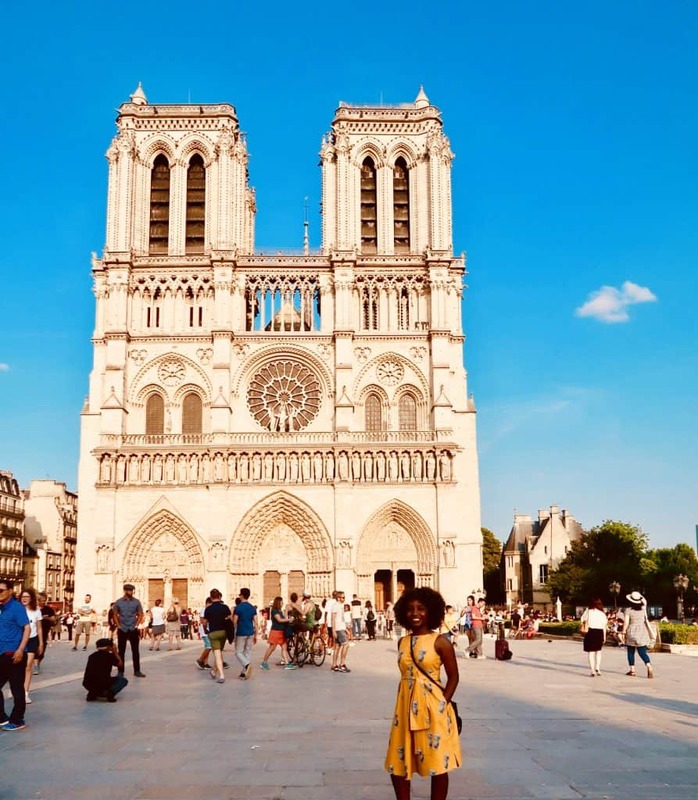 If you’ve visited Paris before, let me know – what have I missed? Just jot it in the comments below :). I miss Paris a lot, it’s been long since I’ve been there. 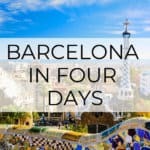 A 4-day trip would be fantastic and the places you recommend look interesting too. I’d probably also rather visit the Centre Georges Pompidou than the Louvre. Both great suggestions – Thanks Stefan! Nice report. I like to look at these types of guides and then I pick from each day or area and wander aimlessly. I end up off the beaten path sometimes and other times spend a day with 5 pl;aces to see only gettingh to 2 or 3 because of my interaction with locals a lot. That is good because I get invited to stuff a lot. I so agree with you that a walking tour is a good idea. It took me a while to be open to this as i don’t like being with groups of tuorists but i have sofened a bit because it really opens up ideas as you are strolling and getting info. 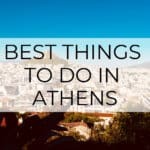 A good break up of the city in your guide. 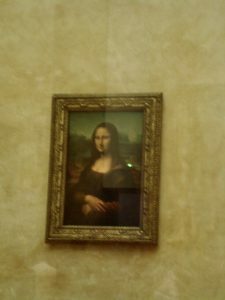 As for seeing the Mona Lisa…not one iota of interest as it is hard to get me inside museums unless I have been to a place several times. I like to spend my time taking pics outside and I wasn’t even interested in going in to see Michelangelos work in Rome. It was hot, I saw the hoardes and ran south to Amalfi. Hey you seem organized in your site and your work! Good job. I feel so lazy in my travels now! Slow travel is also good! I’m working on incorporating some more down time into my personal travels myself. France is really a place that needs be visited to be experienced, in particular Paris and it will soon be on my list of places to visit. Just the shopping experience alone would be exceptional but taking in all the views would certainly make it worth the visit. I visited Paris as a child when we came to Europe on holiday (I grew up in Oz) but I would love to visit again sometime. I lived in France for 6 months in 2013 but in the south so far too far to visit Paris. Your post has made me think again about my travels and one day I will visit Paris again. Some very useful info. Thank you. Glad you found this helpful Sue, hope you can visit soon! Wow, beautiful pictures of Paris! I’ve never been, but I would love to go. I feel like you packed a lot in in 4 days. I really, really enjoyed your “tour” that you gave us. When I go, I’m printing out this post so I know what to do, where to go and how to get there! What was your favorite things to do in Paris? Oh that’s awesome :). 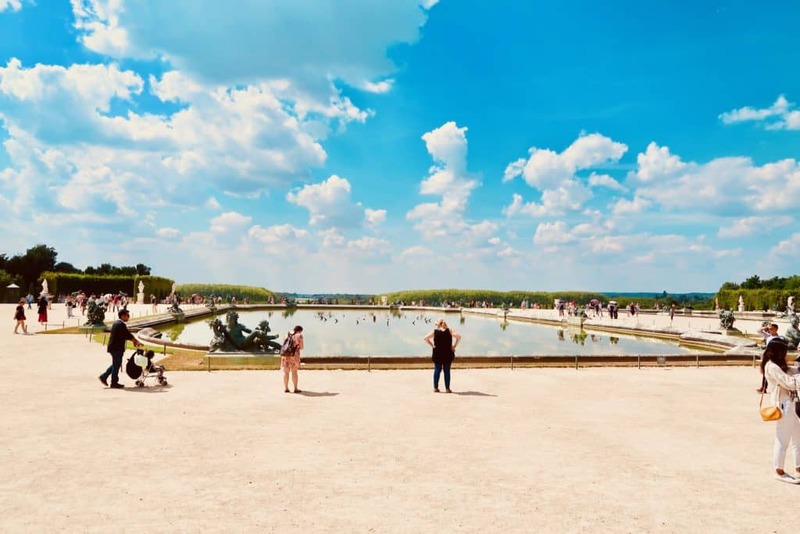 My favorite attraction is Versailles – it’s just beautiful! I really just love walking around Paris though, the vibe is so nice there. So much wonderful information, thank you! I’m planning a trip to Paris soon and will definitely be referencing this article. Glad to hear it , Kaleb! I just wanted to say that I enjoyed your 4-day tour suggestions for Paris. I had the incredible pleasure of visiting the city in 2016/2017. My daughter’s high school marching band was invited to perform in the Champs-Élysées New Years Day Parade. We had a fabulous time. We visited all of the places that you mentioned. I whole-heartedly agree about purchasing tickets beforehand so you do not have to stand in line! Even in the winter, there were lines for everything. I have to say that Notre Dame was my favorite spot. I started to tear up when I was taking it all in.